Topology is a vital concept that helps us understand how geographical features are related to one another. There are a number of ways that different topological relationships can be defined so that we better understand what features border one another, or are enclosed by another feature for instance. 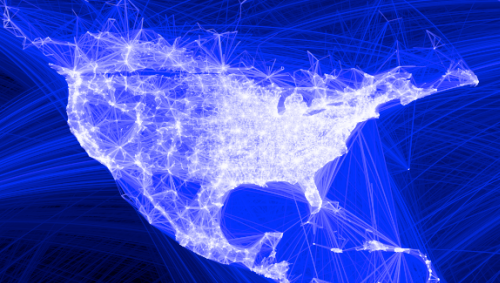 In cartography, such relationships are often implicit yet the relationship of connectivity is often something that can be used explicitly. Subway maps are really just topological diagrams showing connectivity between stations along with symbology that defines lines of equal value (for instance a named route). 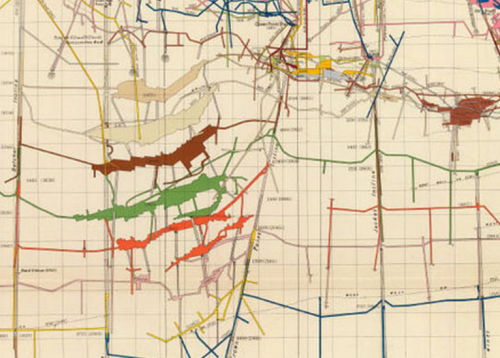 Maps do not always have to show planimetric detail though; and this example of the Comstock Mines map by USGS illustrates how connectivity can be mapped in vertical space. The point at which a mine system enters the ground is largely insignificant in the context of the labrynth that exists below ground. In a system that lacks any form of alternative spatial context it’s vertical and horizontal distances and the connectivity between shafts that dictates the geography. The Comstock Mine maps, a collection of beautifully simple diagrams depicting the mining of silver ore in Nevada in the late 1800s, illustrate how a map can be drawn to show vertical (z) space but on an x, y plane). The slice through the system shows the relative horizontal distance of different shafts but more importantly the vertical distance. Connectivity is clearly illustrated and the use of a graphed background allows the reader to very quickly determine a mine’s depth and also distance. Colours are used effectively to demarcate different horizons in the map and different systems by demarcating each separate hundred feet of depth. These maps, then, are much the same as a modern subway map in that they shows connectivity and the relationship between one component and another clearly. The Comstock Lode was legendary for the amount of mineral wealth it yielded – something close to an inflation-adjusted $400 million in silver and $270 million in gold per year at its peak. It was also instrumental in the development of extraction technology. Here, though, we can marvel at the gorgeous mapping that was produced by George Becker and USGS. 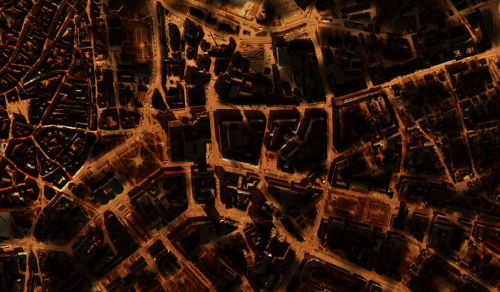 The trend for dark backgrounds and base maps in modern web mapping is widespread. There’s often a good reason since contrast between a base and the figural foreground is helped considerably when you use a flat, sparse background. This could be plain white or, conversely, dark grey or black. Given that most screens use an RGB additive colour model then the natural background is black (0,0,0). This is analogous to a traditional blackboard – with contrast being achieved through the use of white chalk. On screen or on a black background, the natural human perception of darker colours meaning ‘more’ is inverted…so as colour increases in lightness and tends towards white, we perceive more. It’s a dramatic effect and often used with data that itself creates the shape of the geographical features being studied. The impetus for many of these types of image are NASA’s classic Earth at night image where human settlement is clearly picked up through the pattern of urban lighting across an otherwise dark backdrop. We clearly see the outlines of countries and other features. What makes Spin Unit’s work here so mesmerising is that they haven’t merely represented a single phenomena with symbology that ranges from dark to light values to pick out the form of a street network. That would simply be the location of street lights, each one symbolised with a radial symbol with a light centre that fades to black or a linear feature representing a road with equal treatment along its length. Of course, light does not appear that way in reality. Instead, they go way beyond simply showing the position of street lights to define a cartography that measures light from the ground level, where people walk, drive and ride. They use statistical models to predict how public space is illuminated. It’s a predicted surface which reveals far more subtlety in shade and areas of dark and light that define lit and unlit neighbourhoods. 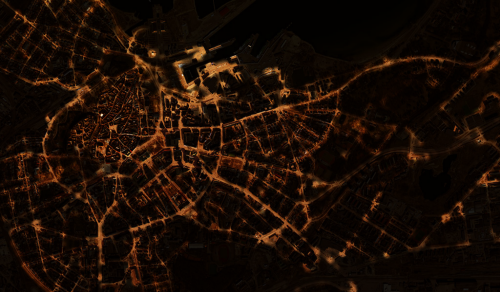 The map shows light intensity for central Tallinn but it’s not actual light…it’s statistically modelled light. 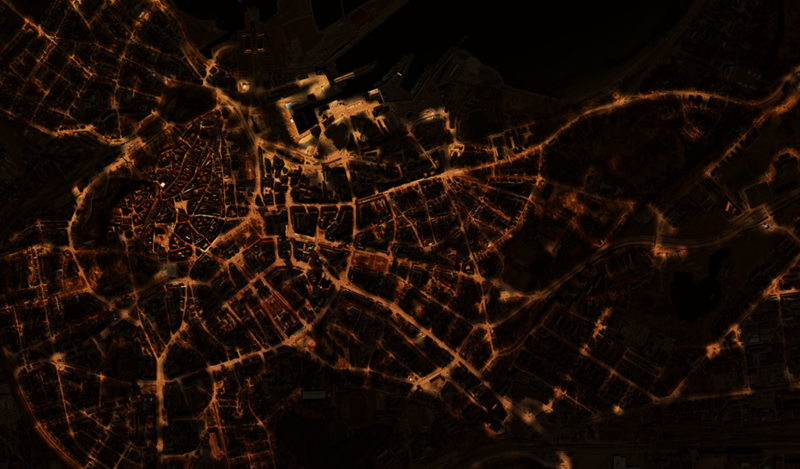 The beauty of the map is that it gives us a look and feel that gets close to what we actually experience walking through dimly lit streets. There isn’t uniform light so why map it as such? Maps do not have to show actual features with simple symbology; instead they can show us information derived from an analytical process to give us a more realistic appearance. What makes this map so intriguing is we perceive it as reality because it makes use of an increasingly familiar mapping style. It works because we are increasingly attuned to seeing such map styles and symbology. It also captures a certain atmosphere and almost looks painted in a smudged fashion with a wide range of dark, light and shadow that picks out different real world features as they might be seen by our own eyes. If a map’s main intent is to communicate information through graphical form then they are, by definition an information graphic. Modern parlance has seen the rise (and over-use) of the term infographic which has become synonymous with dramatic, often abstract representations of data. They are often composed of a collection of linked graphs, punctuated by key words, phrases or numerical highlights…the better ones offer some sort of coherent whole that places an emphasis on a well structured layout. This is also the description of a map. 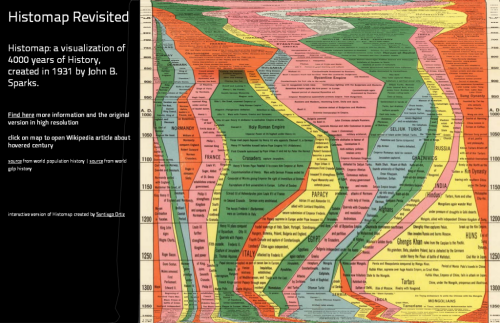 Maps have always been infographics, long before someone invented the term…though in the same way that not all infographics are meaningful or well designed, so the same goes for maps. 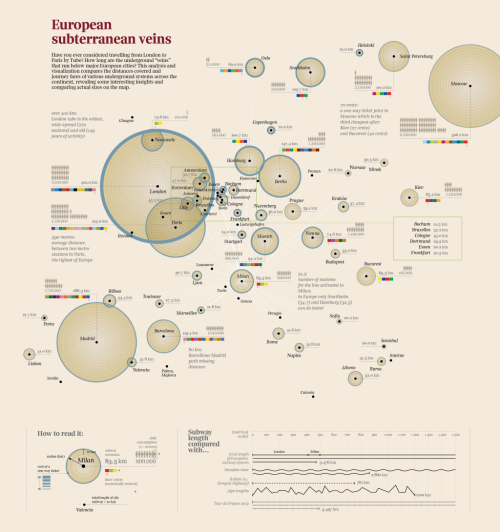 Maps that are abstract (or highly diagrammatic) might very well be seen as belonging to the new fashion for journalistic infographics more than more traditional styles. 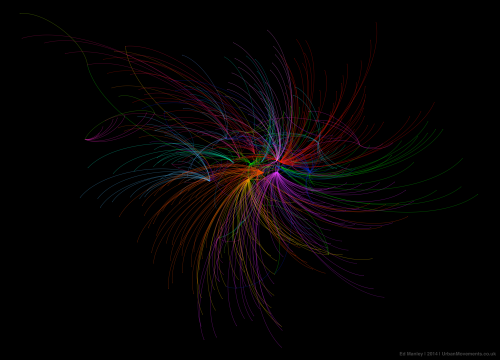 This example by Accurat is a terrific example of taking a single theme and developing a strong, abstract depiction of space through the organisation of a range of graphical elements. The shapes of land/water and any typical geographies are eschewed in favour of a mechanism that simply showcases the information. The structure of these components makes the geography implicit rather than the geography itself being used to organise the content. 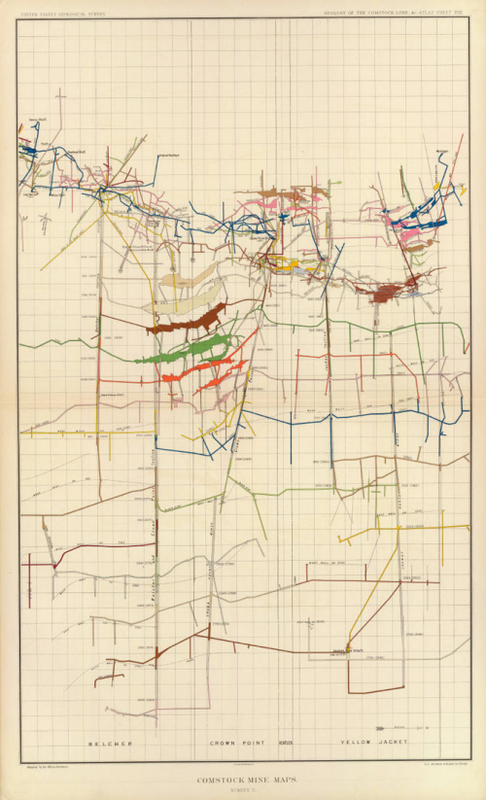 The map provides the reader with a fascinating exploration of the underground transport veins that traverse major European cities. The title is attractive and catchy. The layout is clear and well balanced. The colours are simple and do not compete with each other. 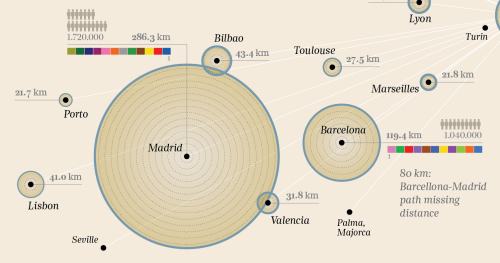 The main elements – the proportionally scaled circles give an immediate sense of comparison and scale. There’s a wealth of information on the number of lines, the number of users, the cost, the length of extensions and the geographical reach of the system. The use of size is used to great effect in different ways to connotate magnitude. Colours show us difference. Small multiples illustrate number of users. Labels and textual components are used as a literal symbol to give us headline facts and figures. All classic visual variables, well executed. There’s an extremely subtle visual hierarchy also at work that organises textual components and shades of colour which together give us a sense of figure and ground as well as contrast. The map itself is clean and well composed but the legend is also extremely well organised giving clear information with even the title ‘legend’ (one of the most pointless labels on any map) being replaced by the far more useful ‘how to read it:’. 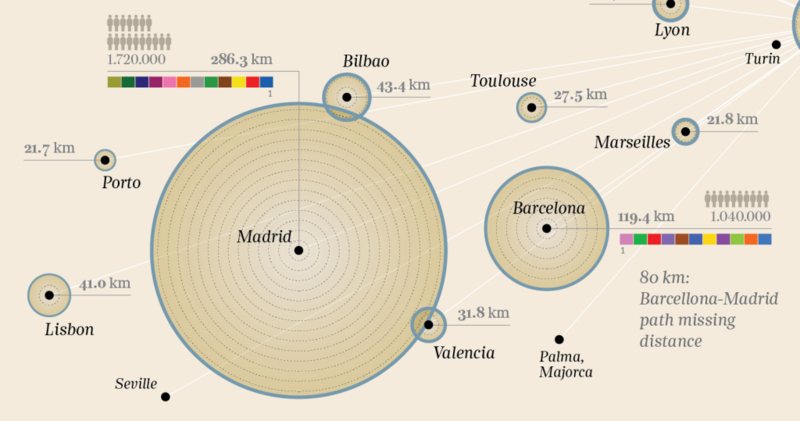 The graph shows us some comparisions with other distances – rivers, mountains, roads and the Tour de France route. Great comparisons that provide some additional perspective. This is a very well constructed information graphic. It deals with data that is organised spatially and the spatial dimension affords us comparisons. 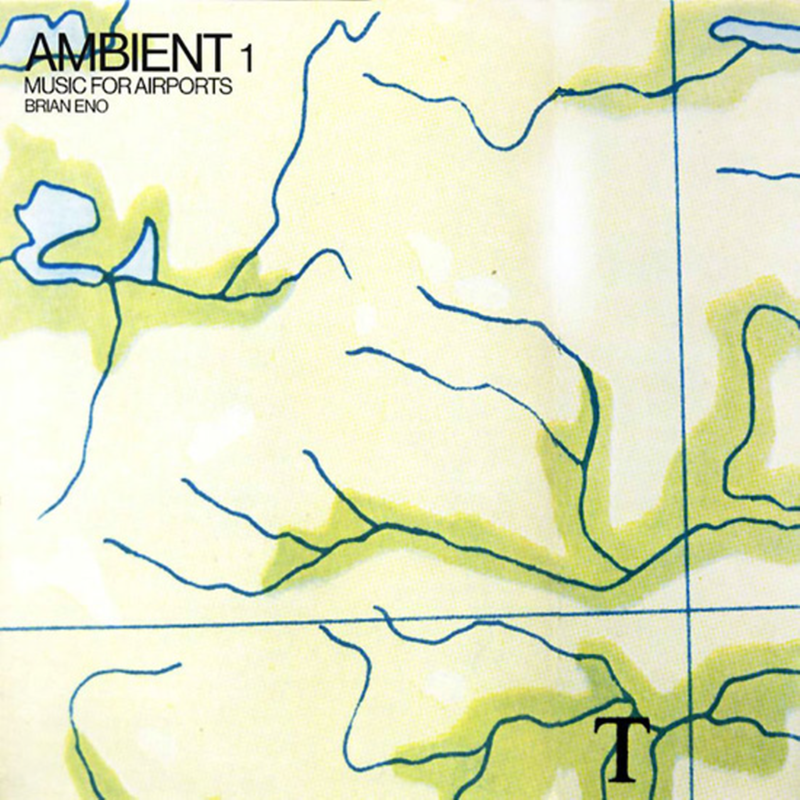 It’s a map…in the same genre as those by Beck, Minard, Snow etc. Virtually every aspect of this map is counter to how you would typically style features with bright contrasting colours and angular shapes yet hiararchy of features is preserved, they are recognisable and can be distinguished from one another in the landscape. The map is not especially useful as a backdrop for other thematic detail yet the point of this is to explore ways of re-imagining the map and challenging our preconceptions of map design. It has a strong aesthetic and although rendered as an online map, the beauty of this work is not necessarily as an online map – as it makes heavy weather of rendering in the browser – but the style it deploys. 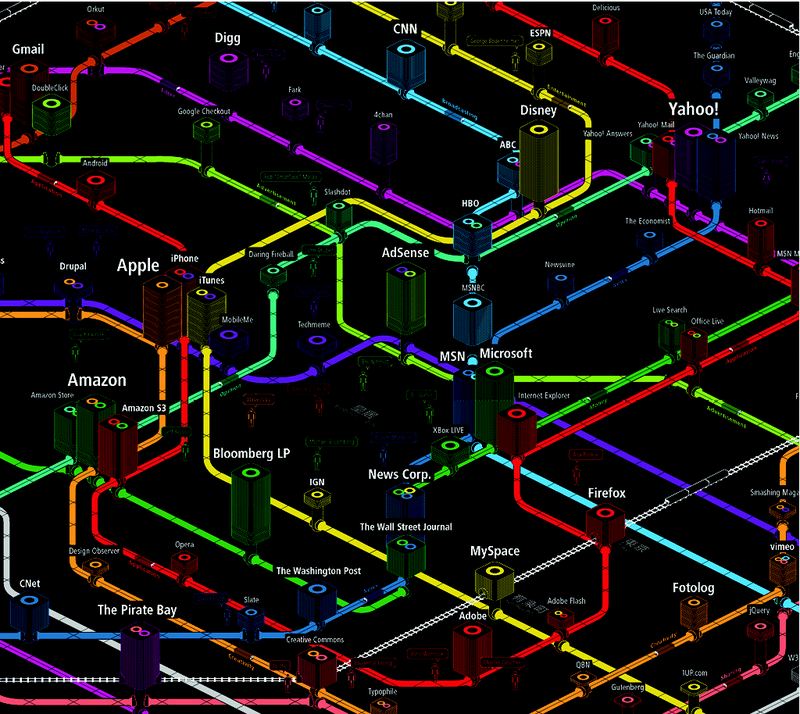 Not the only map of the internet but his well produced schematic maps the most influential internet domains and people onto the Tokyo Metro map. 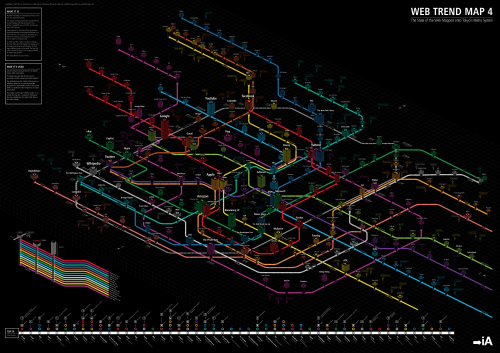 Each domain is assigned to individual stations on the map in ways that complement the characters of each. Complementary websites are grouped to a line that suits it and the map produces inter-linkages among companies in multiple ways inspiring some intriguing interplay. For instance, Twitter is assigned the station with the biggest ‘buzz’ and Google is mapped at Shinjuku which is the world’s busiest station. Web domains can be evaluated based on their position (proximity to a main line or hub representing importance), height (success measured in traffic, revenue and media attention) and width (stability as a business entity). The axonometric gridlines define street level with all subways positioned below the gridded surface. The Trend Setters are labeled using speech bubbles as if they are saying their name and other labeling works well to support differentiation of major trends. The colour palette is extraordinarily vivid and works well against pure black. 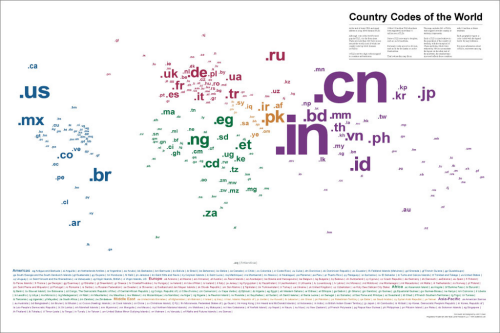 Why map the internet in this way? As iA say themselves: because it works. A map of the world’s top level country code domain names (as of 2008) that efficiently captures a number of pieces of information using some simple cartographic approaches. Locational information is encoded simply through the positioning of each label in the centre of the territory it relates to. 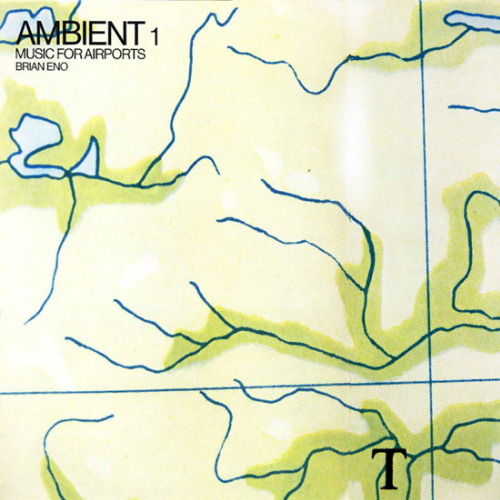 There are no lines or boundaries on the map but because of the use of the label in this way we see the familiar shape of the world emerge. The sizing of labels helps this by varying according to relative population totals…with a contraction of China and India to enable them to fit the layout and a grouping of those countries under 10 million residents to avoid infinitesimally small type. 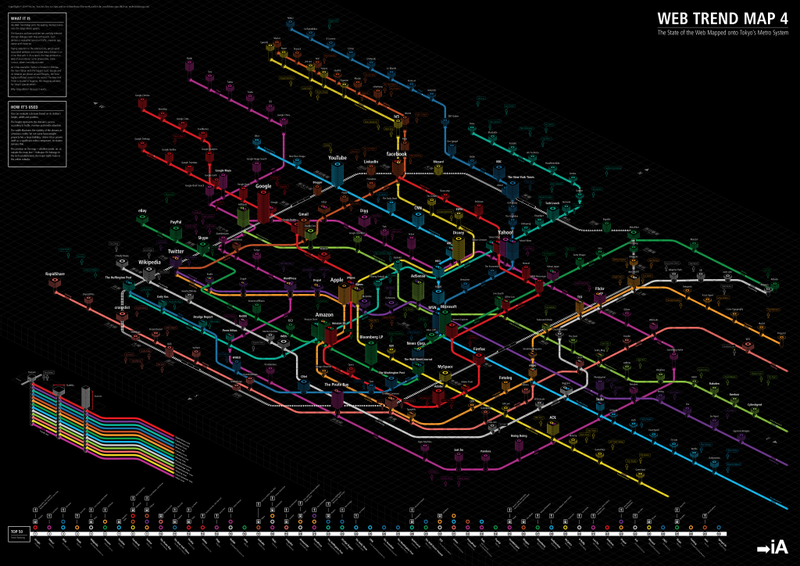 The result is a proportional symbol map of population that uses text as both a literal and a scalable symbol. Colour is used to good effect to identify continents and as a visual link to the legend. 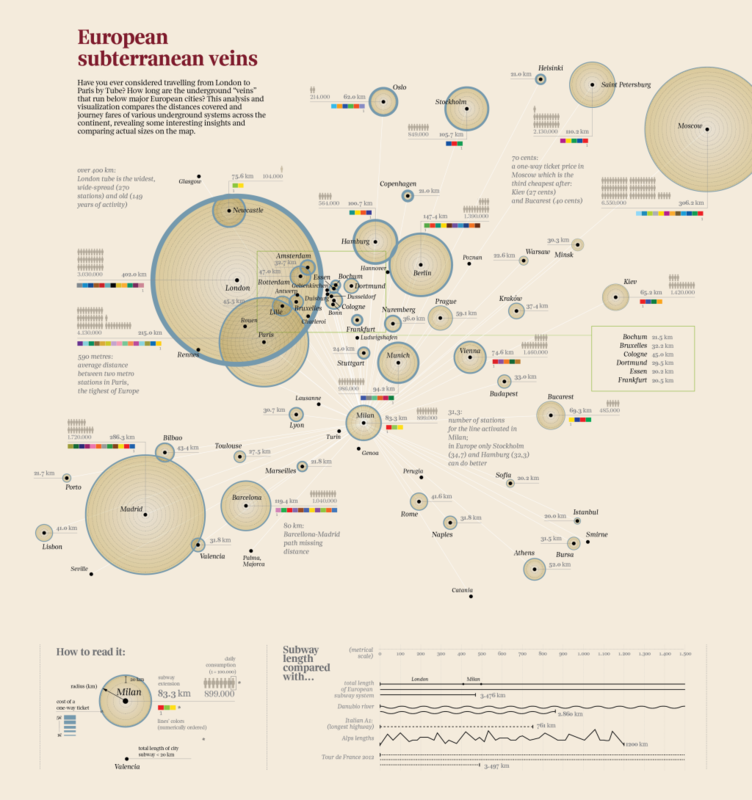 Simple and abstract concept and a good example of the genre of maps whose form relies heavily on typography. The map is available to buy as a high quality print here.